The crew of Sangamithra was at The 70th Cannes Film Festival to unveil the first look of period film Sangamithra, which is touted to be bigger than Baahubali. Shruti Haasan, Jayam Ravi, Khushbu Sundar, A R Rahman and Sundar C were at The 70th Cannes Film Festival to unveil the first look of period film Sangamithra. The crew unveiled the first look of Sangamithra today at the Cannes and it looks absolutely marvelous. The poster of this Shruti Haasan and Jayam Ravi starrer film is listed on the cover page of the Cannes magazine. The makers of Sangamithra, Sri Thenandal Films, posted few pictures, on social media, of the Cannes magazine which has the first look of Sangamithra. One of the posters shows Shruti Haasan in a warrior princess avatar and looks breathtaking. 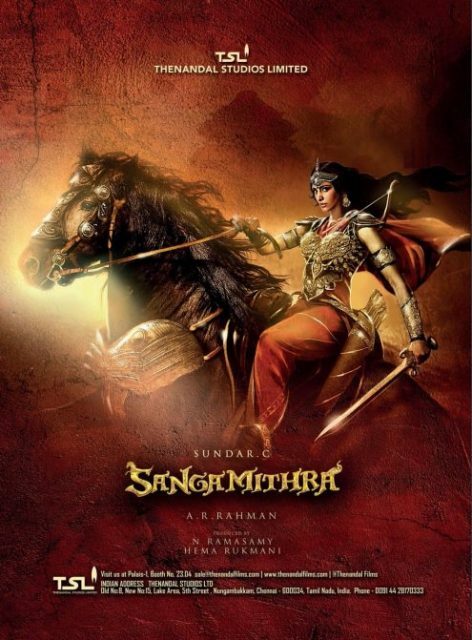 Sangamithra is being directed by Sundar C, husband of actor/politician Khushbu Sundar. The film will be a huge scale like Baahubali and the VFX is expected to be larger than Baahubali. This period film also features Jayam Ravi and Arya playing pivotal roles, besides Shruti Haasan. It is a rare thing that an Indian film’s first look or a teaser being unveiled at The Cannes, and Sangamithra has this distinct milestone now. The expectations on this film are sky high and speculations are that this will be bigger than Baahubali. Shruti Haasan trained hard for her role in Sangamithra and even learnt sword fighting for her character. The music of the film will be composed by maestro A R Rahman. Sundar C, who is the director of Sangamithra, had earlier directed Anbe Sivam with Kamal Haasan which went on to become one of the super hits in Tamil cinema. Agreed! Audience also do not want to watch another movie like Baahubali so soon. Seriously! This movie, the proposed Ramayana and Mahabaratha adaptations, all being made so soon after Baahubali seems like a bad idea.